Why would you want to make this cheesecake? Well you could be on a low fat diet, trying to lose weight, or maybe you might be trying to reduce your sugar consumption. It could be all of the above, as is the case with my family members. While I won’t identify them on the blog, I can tell you that in the past 6 weeks, these 3 inspiring people have managed to lose a combined total of just under 3 stone (that’s 42lbs or 19kg). You don’t need to cook, nor do you need any fancy equipment to be able to make these cheesecake pots, just make sure you have space in the fridge for them to cool. Of course if you’d rather use the full-fat full-sugar version of these ingredients go right ahead! There are 4 pro-points (Weight Watchers plan) per portion, 6 syns per portion (Slimming World plan), and 131 calories per portion for everybody else. From a sugar point of view, I use no sweeteners. However please note that the yoghurt used is sweetened with agave. This means there is fructose in this recipe, along with the fruit sugars from the cherries. Before you start, make sure you have enough space in the fridge then select 6 small pots or espresso cups to set the cheesecake mixture in. Next, take a large sieve and sit it over a saucepan. Open the tin of cherries and pour directly into the sieve. The juice will go into the saucepan and the cherries can now be put to one side in a dish. Put the saucepan on a medium heat and warm the cherry juice through. Once it’s slightly warmer than body temperature and before it boils, turn off the heat. Sprinkle the powdered gelatine into the juice and stir well so that the crystals dissolve. Take a large bowl and using a fork or a whisk, mix together the yoghurt and cream cheese so there are no lumps. Then quickly add in the cherry juice and stir again until you have a smooth mixture. Fill each pot/cup up halfway with the mixture. 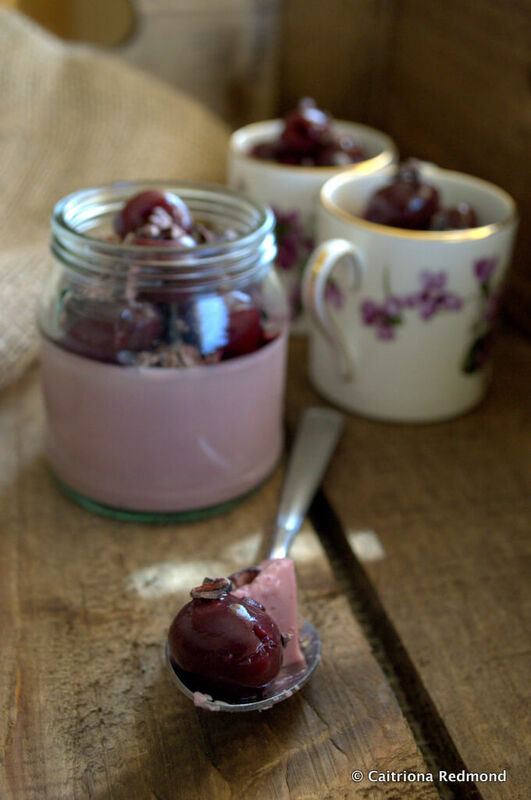 Add a couple of cherries into each pot then top off the pots with the remaining cheesecake mixture. Sprinkle some cacao nibs on top. Put the pots into the fridge to set for at least 2 hours. 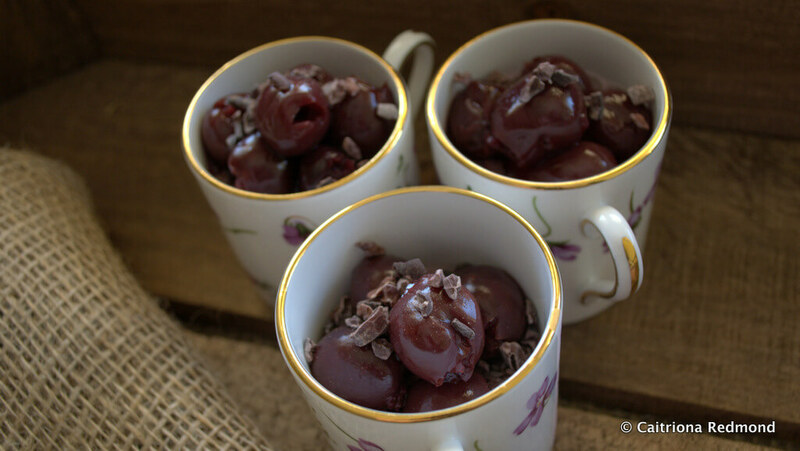 Serve by piling the rest of the cherries on top of the cheesecakes and sprinkling with the rest of the cacao nibs. The gelatine is part of a multi-pack of sachets made by Dr Oetker. The greek yoghurt is made by Glenisk: here I used the new protein yoghurt which I love. I used Phileadelphia cream cheese (the lowest fat version). The raw cacao nibs are from Nua Naturals and are expensive but the tub has lasted me a long time and the quality is great. Any mentions of products and/or brands are personal endorsements and I have not received any payment (financial or benefit in kind) to recommend them. Yum, I also like Quark which is also an alternate low fat soft cheese 😀 this looks great though. Yes Quark is another great alternative – I find it hard to get hold of around here. As opposed to soft. Bah-dum-tish. Sorry! Where do you buy yours? Oh great I’ve not seen it in SuperValu but I’ll look again. My local Dunnes Stores is dreadful so I’ve not a hope of getting it there. Thank you!